It just wouldn’t be an adventure with Shari if a few things weren’t lost, broken or left behind along the way. It’s funny because I don’t consider myself particularly careless, but somehow I just have bad luck when it comes to travel. Last year it was leaving my cell phone behind and then dropping a lens and breaking it before I ever went through security at the Halifax airport. This year, my trip started with lost luggage in Lima. I thought that might be enough bad luck to hold me over for the entire trip, but no … that was only wishful thinking. In case you didn’t read the Lost Luggage post, the gist of it is that I arrived in Lima with 11 of my 12 passengers on the morning of April 6th. All 11 of those folks had their luggage, but mine had decided to take the long route. Not a big deal … I had my camera, that’s what was most important! Only a couple of days into the trip, one of our passengers dropped his glasses on the ground and they broke. It was several days later, as we got ready to do a little tour around the Puno market, that he found a little stand selling eye glasses. Lo and behold, he was able to replace them and despite dropping them a couple more times on the trip, they made the journey! Next casualty of the trip was at Luquina Chico. Audrey brought a nice big Canadian flag with her and she pulled it out and we all gathered around for a group photo. What happens when a group photo gets taken? Everyone hands their cameras over to the person in charge of taking the photo, including me. So, we each handed our cameras over to Elard, our G leader who quickly took a group photo with each of all of our cameras and then handed it back. Mine was somewhere in the middle of the group of cameras. He handed mine back and we all continued to pose for the group photo. After all of the cameras were handed back, Clever gathered our attention to explain what was going to happen for the rest of the day. Pretty much everyone in the group turned to look, and I’m pretty sure my face was white. I picked it up off the ground and looked at the damage. After letting Clever know that he could continue explaining to the group, I half paid attention and half studied the damage. The entire filter was smashed. 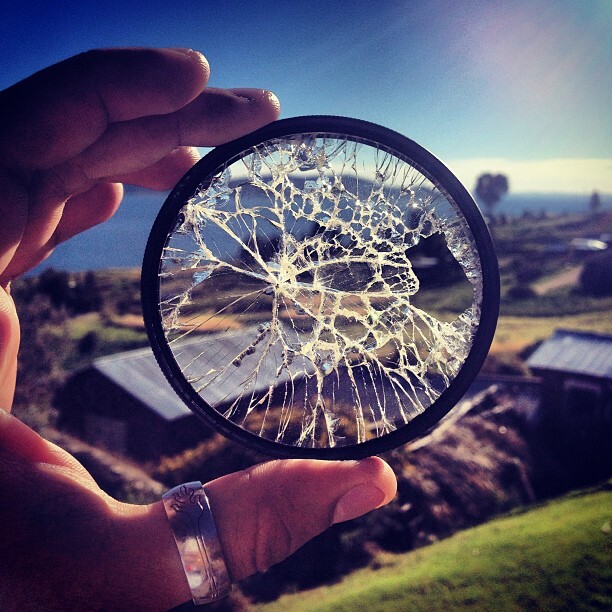 The question was, did the smashed glass from the filter hit the lens? A filter is $60-$100 to replace. The lens is about $1000 to replace. I slowly and tentatively unscrewed the filter from the lens. I could hear the glass shifting and starting to come loose. I had no idea what I was going to find behind that filter. Would my lens be equally as shattered? Finally, when the filter was off, I could see the lens. It had not broken, which was a good start, but with the shards of glass and dust all over it, I couldn’t really see how much damage there was. A little in shock, I decided to just ignore the damage for the time being, pay attention to the day’s plans and deal with it later. When I reached my home stay (about an hour later), I took a closer look. I carefully used my blower & lens pen brush to dust the remaining glass off the lens and held it up in the sun light. Miraculously, the filter had sustained all of the damage and the lens came out perfectly fine. As far as I can tell, not even a scratch. Guess it was my lucky day! 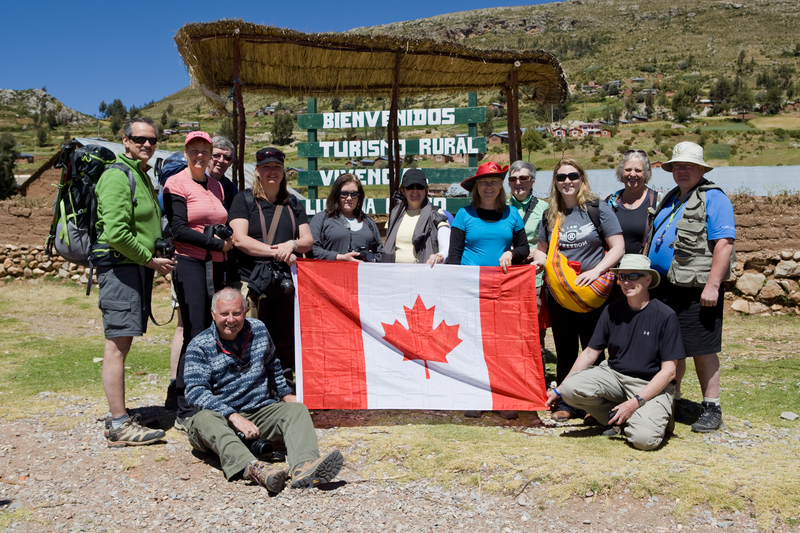 The next day, I stayed back at Luquina Chico while most of the group went on a tour of nearby Taquille island. I loved the tour of Taquille that we did last year, but altitude was affecting me and I knew that I could not do the physical exertion needed for this particular tour. I was really disappointed because they were also taking a different route than I had the year before, so it would have been a new experience for me. They docked at a lovely beach and then meandered their way up, up, up and around the hilly island to the top where the main square is. While they were stopped to take photos of the beach area, Elard borrowed one of the passenger’s converters. Now instead of having a 70-200 lens, it would be more like a 400mm lens. I wasn’t there to see it, but I think he was a little excited. He took off, up another hill to take photos from afar and give the converter a try. Unfortunately, when he got ready to take it all apart and head back down, he dropped his lens with the converter attached to it. This time, the lens didn’t land face down, but instead the rocks bent and twisted the ring that attaches to the camera. 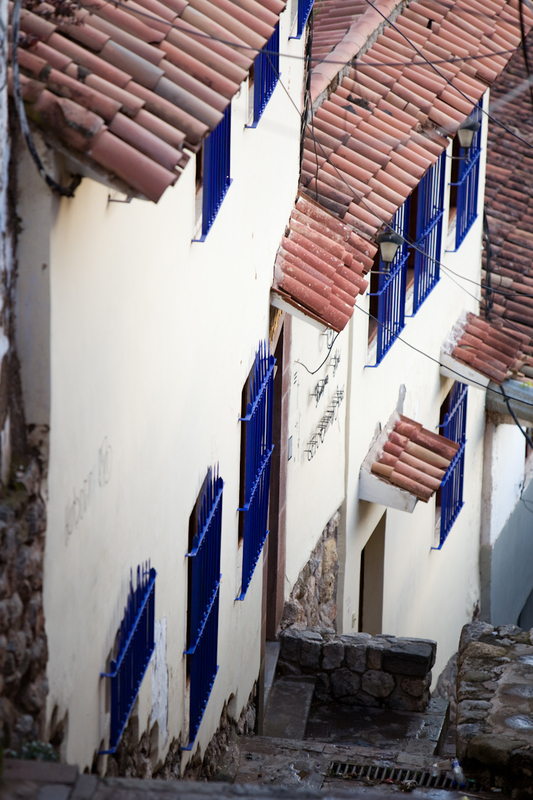 Luckily, a few days later in Cuzco, Elard was able to get the converter fixed relatively inexpensively. The 70-200 (his own), however, is still awaiting repair. It was the day of our night photography workshop. Everyone gathered around with their cameras, tripods and rain gear as we could hear thunder in the distance. 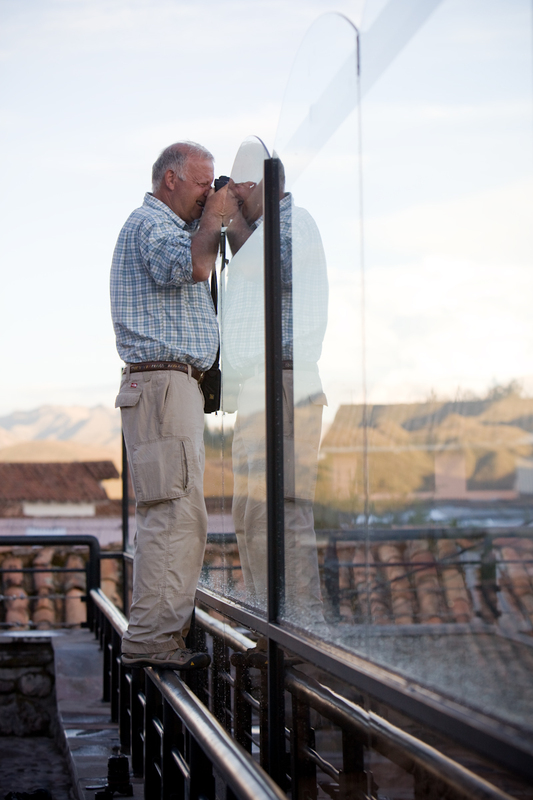 We headed out to an area of Cuzco called San Blas to take some golden hour photos before day turned to night. About half way to San Blas, the rain started to fall. And then, it started to pour. We quickly dashed into a little bar for drinks, hoping that the rain would quickly pass. Not the best night to be out finding ‘golden hour’ … more like ‘grey hour’. After about half an hour of chit chat and drinks, the rain had stopped and we continued on our way up the hill to San Blas. We arrived to see vendors setting up their street market areas again and the sun just starting to peak through the clouds. Maybe we’d be lucky and see the sun again before nightfall. Everyone went their separate ways to find something interesting to photograph in this quaint little bohemian neighbourhood. After snapping a few photos in the main square area, Elard and I headed up, up, up higher where we could get an even better view of the city. I took this photo along the way, when I needed to stop and catch my breath. At the top of the hill, we found a small common area, enclosed by glass and one of the participants was climbing up on the railing to take photos. I set my tripod down to line up my photo of Paul. Took a few shots and then we headed back down the stairs to our meeting point for the group. 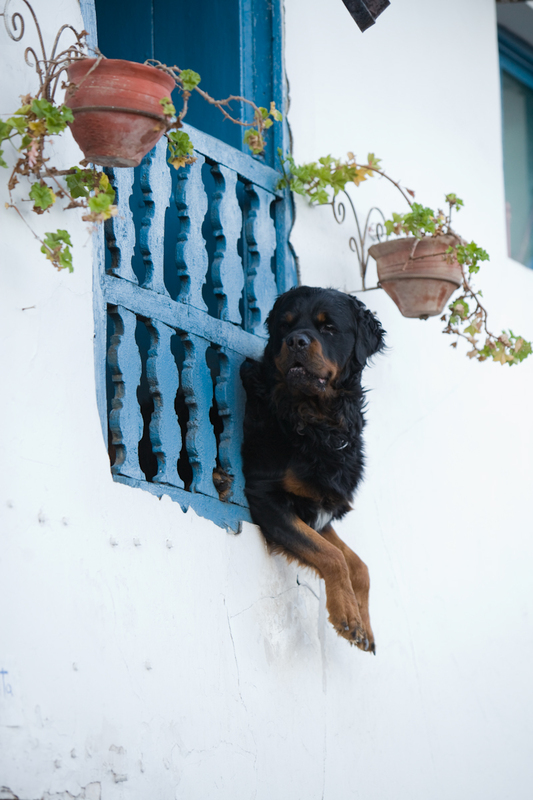 Quite a few group members were standing around staring at this little spectacle where a huge dog was greeting people, squeezed through the rungs on a partial balcony. It was quite the commotion when two or three other little dogs decided to join him. After taking pictures of this curious dog watching over all of us from above, I got ready to gather everyone up to leave when I realized that I was missing something. Where was my tripod? Had I given it to someone to hold? Had I set it down? Damn it. I had left it at the top of the hill. Elard looked at my sadly and I laughed and said ‘I don’t think I’m going back up there to get it!’ The next thing I knew, he was headed that direction. I stopped him and said I would go. I walked to the end of the street, took one look at how many stairs there were to the top, turned on my heel and marched right back to the group. To that, a couple of the men from the trip offered to go back up and looked for it, but I argued that it really wasn’t worth it. The tripod had been at least seven or eight years old, only cost $30 and it really was broken. I had decided to bring it with me because my good tripod was too heavy and the part that was broken on this one, I could work around for the few shots that I would be taking with it. The next thing I knew, someone was asking me questions about photography and then, out of the corner of my eye I see Elard sprinting up the street. I yelled for him not to bother, but he kept going. I really didn’t want him to go all the way back to the top for my broken tripod that may or may not be there, but there was no way I was running after him (at altitude) to try to stop him! A few minutes later, Elard returned, breathless from hurrying up and down the stairs ….. no tripod to be found. So, all I can do is hope that someone in need found the tripod and will sell it on the street or at a market somewhere and make enough money for a day or two of food for themselves and their family. Good news out of all of this? One less thing to carry in my backpack. Five pounds lighter and easier to pack! Oh, the casualties of a photo tour.